inhibition of neuroblast and glialblast proliferation or migration from the germinal matrix (GM) to the appropriate functional location in the brain. The GM is a thick, vascular rich, layer of precursor neurons and glial cells just below the ependymal lining of the lateral ventricles and the third ventricle. 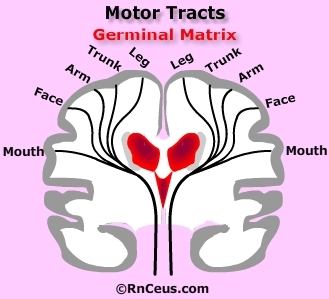 The GM is the origin of migrating neurons in the 1st trimester and glial cells in the 2nd & 3rd trimesters. Activity in the GM peaks between 8 and 28 weeks of gestation. The GM is highly vulnerable to injury and changes in blood pressure. failure of oligodendrocytes to proliferate, differentiate and myelinate axons in the cerebral white matter. Immature oligodendrocytes are vulnerable to ischemia, glutamate toxicity and inflammation mediated free radical injury. poor function at the synapses, or connections between brain cells, which causes faulty or nonexistent transmission of nerve impulses between the cells. Symptoms of injuries occuring before or during birth are classified as congenital CP. The majority of CP (85%–90%) is congenital. CP resulting from injury occurring at least 28 days after birth is classified as acquired CP. Symptoms resulting from brain injuries occuring after 5 years old are not considered CP. Damage to the white matter of the brain (periventricular leukomalacia, or PVL). The white matter of the brain is responsible for transmitting signals inside the brain and to the rest of the body. Damage from PVL looks like tiny holes in the white matter of an infant’s brain. These gaps in brain tissue interfere with the normal transmission of signals. Researchers have identified a period of selective vulnerability in the developing fetal brain, a period of time between 26 and 34 weeks of gestation, in which periventricular white matter is particularly sensitive to insults and injury. Abnormal development of the brain (cerebral dysgenesis). Any interruption of the normal process of brain growth during fetal development can cause brain malformations that interfere with the transmission of brain signals. Mutations in the genes that control brain development during this early period can keep the brain from developing normally. Infections, fevers, trauma, or other conditions that cause unhealthy conditions in the womb also put an unborn baby’s nervous system at risk. Bleeding in the brain (intracranial hemorrhage). Bleeding inside the brain from blocked or broken blood vessels is commonly caused by fetal stroke. Some babies suffer a stroke while still in the womb because of blood clots in the placenta that block blood flow in the brain. Other types of fetal stroke are caused by malformed or weak blood vessels in the brain or by blood-clotting abnormalities. Maternal high blood pressure (hypertension) is a common medical disorder during pregnancy and is more common in babies with fetal stroke. Maternal infection, especially pelvic inflammatory disease, has also been shown to increase the risk of fetal stroke. Severe lack of oxygen in the brain. Asphyxia, a lack of oxygen in the brain caused by an interruption in breathing or poor oxygen supply, is common for a brief period of time in babies due to the stress of labor and delivery. If the supply of oxygen is cut off or reduced for lengthy periods, an infant can develop a type of brain damage called hypoxic-ischemic encephalopathy, which destroys tissue in the cerebral motor cortex and other areas of the brain. This kind of damage can also be caused by severe maternal low blood pressure, rupture of the uterus, detachment of the placenta, or problems involving the umbilical cord, or severe trauma to the head during labor and delivery. Low birthweight and premature birth. Premature babies (born less than 37 weeks into pregnancy) and babies weighing less than 5 ½ pounds at birth have a much higher risk of developing cerebral palsy than full-term, heavier weight babies. Tiny babies born at very early gestational ages are especially at risk. Infections during pregnancy. Infections such as toxoplasmosis, rubella (German measles), cytomegalovirus, and herpes, can infect the womb and placenta. Inflammation triggered by infection may then go on to damage the developing nervous system in an unborn baby. Maternal fever during pregnancy or delivery can also set off this kind of inflammatory response. Blood type incompatibility between mother and child. Rh incompatibility is a condition that develops when a mother’s Rh blood type (either positive or negative) is different from the blood type of her baby. The mother’s system doesn’t tolerate the baby’s different blood type and her body will begin to make antibodies that will attack and kill her baby’s blood cells, which can cause brain damage. Breech presentation. Babies with cerebral palsy are more likely to be in a breech position (feet first) instead of head first at the beginning of labor. Babies who are unusually floppy as fetuses are more likely to be born in the breech position. Low Apgar score. The Apgar score is a numbered rating that reflects a newborn's physical health. Doctors periodically score a baby's heart rate, breathing, muscle tone, reflexes, and skin color during the first minutes after birth. A low score at 10-20 minutes after delivery is often considered an important sign of potential problems such as CP. Jaundice. More than 50 percent of newborns develop jaundice (a yellowing of the skin or whites of the eyes) after birth when bilirubin, a substance normally found in bile, builds up faster than their livers can break it down and pass it from the body. Severe, untreated jaundice can kill brain cells and can cause deafness and CP.